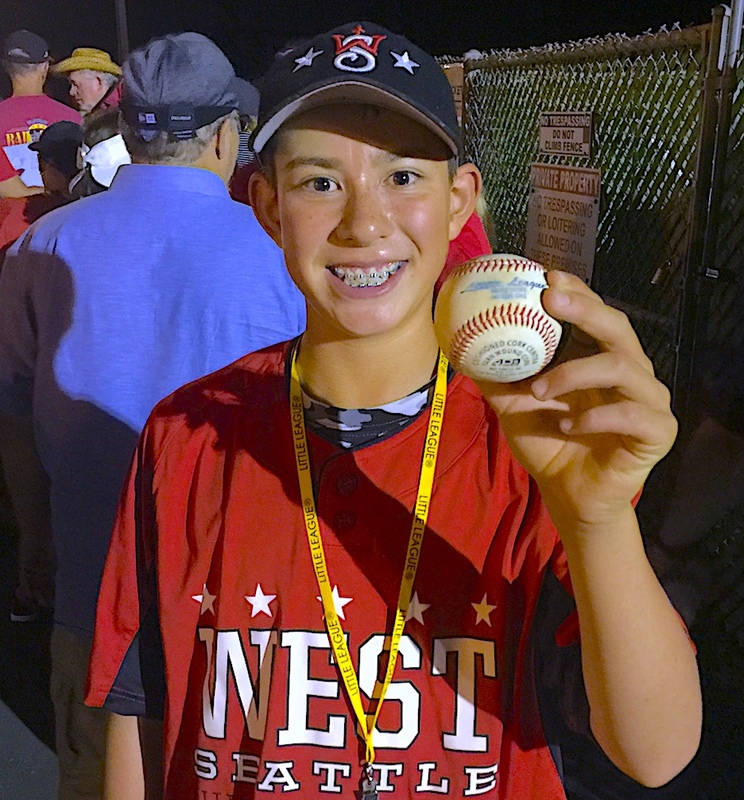 Jake Daily holds up the home run ball after West Seattle defeated Alaska in the 2nd round contest of Little League playoffs in San Bernadino, CA. Washington state champion West Seattle went out and won by an 11-2 score over Alaska at the Little League baseball all-star Northwest Regional tournament in San Bernardino, Calif. on Tuesday, after opening with a 16-6 loss to Idaho two days earlier. The Westsiders advance to play Oregon at 4 p.m. Wednesday, with the winner of that game going on to the loser's bracket final at 12 p.m. Friday. Friday's winner goes on to 12 p.m. Saturday championship play needing to win twice to take the title and advance to the Aug. 16-26 World Series in Williamsport, Penn. Matthew Hazlegrove, Miles Gosztola and TJ Buehring had two hits each for West Seattle on Tuesday and Matthew Henning-Dierickx, Jake Daily and Hazlegrove led with two RBI each. Hennung-Dierickx struck out five in 3.2 innings as the starter.